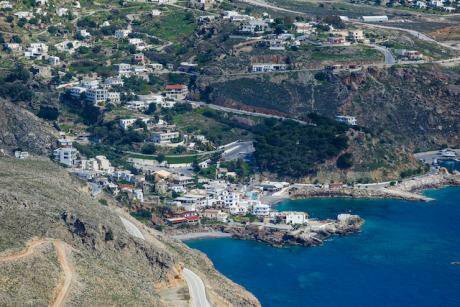 The small village of Chora Sfakion, Sfakia, Chania, southern part of Crete island, Greece. NurPhoto/Press Association. All rights reserved. “Those columns there,” he says pointing at the stone colonnade of the cosy village-square café we were sitting in, “my father built those. He was the better craftsman. I struggle to make ends meet.” He had picked the venue. I wondered if it was just to point that out. He is one of hundreds of Greeks I have met in my tour of the country in the last four months. I have been visiting every prefecture capital to set up the infrastructure for our party, MeRA25, to run in the upcoming European (and almost certainly national) elections. A daunting task, both practically – 80% of the country is mountainous and getting anywhere involves a long, potholed, winding road – as well as psychologically. Nowhere is the crushing effect of the Troika’s near-decade-long austerity policies more depressingly obvious than in the deserted high-streets and squares of the country’s provincial towns and villages. It is not any difference in skill, talent, or dedication that accounts for the difference in professional success between this man and his father. Rather, it all boils down to living in a healthy economy, versus living in an economy in tatters. Yet, Greeks have been told that they are to blame for the apocalyptic fate of their nation: it is the direct result of the inherent indolence and corruption of Greek society. Some have had this slander repeated enough times to internalise it. Combined with the 2015 crushing of those who refused to believe it, the result is an economy and a society both in depression. This phenomenon shocked me the most: I attempted to describe it in an earlier piece when I first moved back home after an 8-year-long absence. Self-loathing is a form of propaganda perfected by the New Democracy party as the representative of the Greek elite, but used extensively by many, including the country’s media. Self-loathing is a form of propaganda perfected by the New Democracy party as the representative of the Greek elite, but used extensively by many, including the country’s media. It consists of a number of stereotypes perpetuated within Greece and beyond it, that describe an uncultured, uneducated, work-shy, corrupt Greek people that deserves austerity and is to blame for the rightful subjugation of our sovereignty to the enlightened rule of western Europe. This rhetoric, although never explicit, has served to create a Greek mentality that places ‘Europe’ as a culture separate and superior to our own, and one towards which we should aspire, despite our ‘natural’ shortcomings. This world-view was also at the heart of the campaign against the Greek debt renegotiation of 2015 as well the YES vote in the Greek referendum of 2015, which portrayed the potential rejection of austerity as an existential threat to our ties with Europe and the triumph of the uneducated Greek masses who had been misled by populists. This is a mentality with which many progressives, who see themselves as European and their country as a problematic yet inseparable part of Europe, have been at odds since our socio-economic odyssey began. There is no “us and them” in Europe. We all are Europe. The most common way of dealing with the economic crisis, is by escaping from it. To migrate, to claim the bright future that you were promised in return for your studies and hard work. This promise has led thousands of people (educated at the taxpayers’ expense) to flee the desertification of their country for a brighter future in the flourishing European heartland: Germany, Scandinavia, the Netherlands. Since the beginning of the crisis, 700,000 people have left Greece; that is over 6% of the population, with a further 800,000 estimated to leave in the next 8 years. This has brought back a trend of mass migration not seen in Greece since the late 70s, a phenomenon the country thought it had left behind for good. This draining of the European periphery in favour of western and northern Europe will not – indeed, cannot – last. It is economically, socially and politically unsustainable. Unless it is reversed through progressive policies that aim at redistributing Europe’s riches and creating opportunities across the Union, it will lead to the disintegration of the EU. And the EU will be remembered for its short-sightedness and delusions, rather than the great promise it held for peace, solidarity and progress. We must bring European prosperity to all of the continent’s craftsmen, regardless of where they live. Hospitality is one of those Greek clichés. Smiling people urge you into their humble abodes, carrying trays of local produce that nourish the soul with their pure flavour as well as with the openness and selflessness with which they are offered. This is one tradition that has lasted the test of time: you still come across it in Greece. We certainly have. Following our event in Corfu, where curious locals gathered in a popular taverna to hear what our new party was about, our member Spyros took us to his mother’s house in the heartland of the island. We were to be his guests. We arrived to a simple but hearty feast. Homegrown vegetables, the neighbour’s wine, meat from a friend in town, and some home-made tsipouro to help us digest it all and to get us talking. And talk we did. Spyros is a lawyer and has been practicing for well over 30 years. He has seen the country go through many phases, but none like this one, he says. There is a sense of unconditional surrender to the way with which people have removed themselves from political life. This is made all the starker by the juxtaposition to the people who had spent five years regularly taking to the streets, prior to 2015, to oppose the dismantling of their nation. And yet, it is far worse than that. The great success of the Brussels establishment was to convince Greeks that democracy cannot be allowed to affect economic decisions. The “Schäuble Doctrine” if you like. This has led a part of the populace, which is none the less indignant and frustrated, to use other issues, such as the Macedonian question, as vehicles for political expression. Multiple participants have spoken to me about how our country is being “sold off” to foreign interests, how we are being humiliated and brought to our knees by outsiders, lambasting the “traitors” who would rather act against the interests of Greeks than lose their positions of power. All of this was said about the agreement with FYROM and those behind it, but I could not help but hear, underlying it all, a suppressed criticism of Greece’s Sisyphean condition and their own political disenfranchisement. Once, such indignation was expressed through determined public demonstrations. Perhaps it is still, but now it masquerades as nationalism. This transformation, which has simultaneously shut people out from meaningful participation in politics and destroyed the economic basis of their prosperity, can lead my country to fascism. “I have no problem with anyone,” she will start, like they always do “but it just isn’t fair for Syrians to come here and receive 580 euros per month just for sitting on the beach all year long. We work hard and still we are hungry. My kids are forced to leave our country, and they come here and live like kings. We all have our limits.” They are of coursing repeating untruths, or “fake news” as we have taken to calling them. A refugee staying in the Moria camp in Lesvos will receive 90 euros per month (unless they are staying in facilities that require them to cook for themselves the amount increases to 140 euros per month). In any case, the amount does not rise above 330 euros per month, which is reserved for families with seven or more children. The money is allocated from the Directorate-General for European Civil Protection and Humanitarian Aid Operations (ECHO), a body of the European Commission, not from the impoverished Greek state. For those who legally receive asylum in Greece, there is a governmental order that limits their allowance to “1 euro less” than that offered to Greeks deemed in need of social financial assistance. However, it does not matter if the above statement is based on even the remotest of truths; what matters is that for millions of desperate people, it feels true. One of the many mistakes of the left is assuming that those who vote for fascists, are fascists. They are not. They are desperate, often ill-informed, people who seek to be represented politically. Unless we can accept that the people we are addressing are potential voters for the far-right, and we do not morally condemn them for that possibility, we will always lose to fascists and we will never live-up to the obligation of representing the disenfranchised working class. Unless we can accept that the people we are addressing are potential voters for the far-right, and we do not morally condemn them for that possibility, we will always lose to fascists. The far-right cannot take credit for its own rise. If people are turning to authoritarianism because democracy has let them down, it is progressive democrats who have disappointed them and who are to blame for being unable to offer an ambitious, inspiring alternative that captures peoples’ imagination. SYRIZA’s failure to offer a progressive alternative to Greece’s financial woes and the pressure exerted on Greece by European leaders, has led many on the Left to conclude that such an alternative is altogether unattainable within the EU. Echoes of this conclusion can now be heard across Europe’s Left, and it is as dangerous as the extreme-right. It is by conceding defeat at the international level that the Left will become terminally incoherent. If the Left cannot find solutions to a world without borders then it has failed; it does not have the luxury to retreat to the nation state. These thoughts swirled around that bucolic night in rural Corfu, where the rise of the far-right, amid the olive groves, bleating goats and tsipouro, felt as far away as the economic and political crisis that was bringing it about. She came to the meeting three hours late. It was 11pm on a Wednesday and we were all tired and ready for bed. She had just finished locking up the local branch of a Greek supermarket chain that she manages, and although she had been working since 6am, she insisted on taking us out for drinks and a chat about what could be done to support MeRA25 in her city. Turns out she had lost her job as the regional manager of several luxury hotels in Greece at the beginning of the crisis. After a couple of years of unemployment, she found a job for the supermarket chain she is currently working for, and quickly rose in the ranks to become manager. She was looking for a “real challenge”. I cannot but smile when the stereotype of the “lazy Greek” comes to mind while speaking to people like her. She is a reminder of reality: Greeks are the Europeans working the longest hours. This has been the greatest outcome of this tour of ours, especially for an Athenian such as myself: coming face-to-face with “the rest of Greece”, and that outside the tourist season. This has been the greatest outcome of this tour of ours, especially for an Athenian such as myself: coming face-to-face with “the rest of Greece”, and that outside the tourist season. Meeting the farmers and small businessmen/women who make up the majority of our economy and whose work extends beyond the sunshine of August into long, difficult winters. It is a humbling experience meeting the people your party wishes to represent. One method for doing this effectively is by listening to them and that’s one of the goals of our tour. The other is by empowering them to represent themselves and that’s our second goal. MeRA’s local teams will not be coordinated by experts from Athens, but by these locals themselves. MeRA25 seeks to offer an alternative. The alternative can only be offered if the constituent parts of the party, and the way they interact, are free of old, corrupt and nepotistic elements. We will not reproduce the same old system in our effort to uproot it – that is to say, we will not be SYRIZA. In fact, the party has taken up so much of the collapsed PASOK infrastructure and personnel that many locals tell us how they are afraid of revealing their affiliation to us for fear of losing their jobs or facing repercussions from the local, ultra-partisan authorities. And yet, here she was, buying us our third drink of the night at her friend’s hotel lobby, in the crowded main square of her hometown. And we planned our resistance. It is unacceptable that our citizens feel physically or psychologically barred from expressing their political views or from becoming politically active themselves. Our democracy is currently on life support, deprived of real choice and diversity that is its oxygen; a vacuum from which only the far-right ever triumphs. It is therefore not only our political mission, but also our historic duty, to continue our tours that seek to force open a space for political alternatives in the Greek electoral scene. To persuade Greeks that there can be hope for the future and that they should dare, once more, to believe in something.